Our quarterly "Open Eyes" newsletter contains talks and essays by Adi Da, stories from His devotees, and notices of upcoming events. 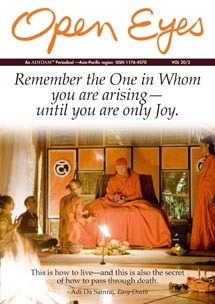 Volume 20 - Number 2 (pdf file, 747k) —"Remember the One in Whom you are arising"
Not on our mailing list? Please fill in the form below if you would like to receive our newsletter which is sent by mail and/or email. please indicate your choice of mail and/or email and comments here. Volume 20 - Number 1 (pdf file, 284k) —"Concious Light Is what Is"
Volume 19 - Number 4 (pdf file, 264k) —"Look for something Greater"
Adidam Australia Supplement (pdf file, 2.1 MB) — Events June - August, 2012. Volume 17 - Number 1 (pdf file, 2.0 MB) — Why Are Spiritual Masters Necessary? Adidam Australia Supplement (pdf file, 185 KB) — Events March - May, 2012. Volume 16 - Number 3 (pdf file, 2.4 MB) — Real God is Not a Parent Figure. Adidam Australia Supplement (pdf file, 230 KB) — Events December, 2011. Volume 16 - Number 1 (pdf file, 1.9 MB) — A Liberating Understanding. Adidam Australia Supplement (pdf file, 211 KB) — Events from April through May, 2011. Volume 15 - Number 3 (pdf file, 1.7 MB) — True Humor. Adidam Australia Supplement (pdf file, 240 KB) — Events from September through November, 2010. Volume 15 - Number 2 (pdf file, 1.6 MB) — The True Condition of Existence. Adidam Australia Supplement (pdf file, 174 KB) — Events from June through August, 2010. Volume 15 - Number 1 (pdf file, .3 MB) — Love is the Practice. Adidam Australia Supplement (pdf file, 171 KB) — Events from March through May, 2010. Volume 14 - Number 2 (pdf file, .89 MB) — The Ancient Walk-About Way. Adidam Australia Supplement (pdf file, 187 KB) — Events from December, 2009 through February, 2010. Volume 14 - Number 1 (pdf file, 1.1MB) — The Egoless Nature of Spiritual Enlightenment. Adidam Australia Supplement (pdf file, .17MB) — Events from September through November, 2009. Adidam Australia Supplement (pdf file, .16MB) — Events from June through August, 2009. Volume 13 - Number 2 (pdf file, 4.3MB) -- The World As Light. Adidam Australia Supplement (pdf file, .17MB) -- Events from September through November, 2008. Volume 13 - Number 1 (pdf file, 3.3MB) -- Poetry of the Heart. Adidam Australia Supplement (pdf file, .17MB) -- Events from May through July, 2008. Volume 12 - Number 4 (pdf file, .71MB) -- The focus of this issue is compassion for others.